Thursday evening palms were sweaty and thumbs were eagerly hovering over a tantalizing red button. No, there was not a video game conference in town. 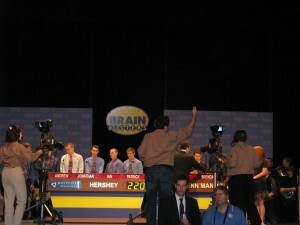 It was, however, the ninth season championship of Brain Busters with our very own Penn Manor quiz bowl team competing in the finals. Coached by Chris Meier and Sallie Bookman, the quiz bowl team traveled to Harrisburg to compete against the Hershey quiz bowl team at the Whitaker Center – neutral territory for the two finalists. Also accompanying the team was the Penn Manor Jazz Band, playing the breaks between rounds. “I came to support my friends. It’s really exciting to see them [Penn Manor’s team] come this far,” said enthusiastic fan, Haley Blazer, on the bus ride there. Penn Manor had a bus full of avid QB fans with their faces painted blue. Spirits were up and students and parents were ready to cheer the Penn Manor brainiacs to victory. The atmosphere was charged with excitement and an “applause” sign was ready to be held up and a nervous hush plagued the crowd. Lars Anderson, Grant Elledge, team captain, Henry Stewart, Brendan Stoeckle and Christine Sharp, the team alternate, were ready to bust their brains against Hershey’s team as they stood confident behind their podium. This competition had, as its host, veteran master of ceremonies, Rich Rosen, firing questions at the two teams. A player from either team could “buzz in” if they knew the answer. There were multiple rounds to this tense competition. “We’re pretty comfortable getting use to competing. We’re ready to go,” said Elledge before the match. There was much truth to those words for Penn Manor took the lead after the first round. Throughout the night both teams remained neck and neck. “There’s a little more pressure [tonight] but we’re going to keep doing what we’ve been doing,” said Stoeckle. This was Penn Manor’s sixth match of the season. They had won the first five. Penn Manor was up by 30 after the lightning round, but there was still one more normal round, and an additional bonus round. Nervous jitters consumed the audience as they sat on the edge of their seats. Everyone was waiting to hear that soft beep coming from either team. Slowly, Hershey started racking in the points, and in the end won with a final score of 470 Hershey 370 Penn Manor. Comet Man comes out to support our Penn Manor team. Though they were not victorious, fans, including Comet Man, bombarded the stage to congratulate the team as they walked away with a $4,000 check to split between all team members. All-in-all, Penn Manor’s team proved that they are a force to be reckoned with. Smiles, cheers and even a sing-a-long to the Pokemon theme song brought this bus home. Tune into WGALTV Saturday to watch the recording of the show. Congratulations to the team and coaches on a stellar season. To come in second out of 40 some teams and to win $4000.00 – wow! That’s great! GOOD JOB! Winning by 100 points is even better .